IBM wasn’t always the technology giant it is today. Founded by Thomas J. Watson in 1917, IBM got its start making simple business machinery such as scales, time clocks, punch cards and tabulating machines. In the years that followed, the company flourished as Watson accurately predicted a rise in the demand for data processing solutions and hired the best engineers to make his products stand above the competition. With the stock market in a tailspin and unemployment reaching 30% — most businesses, if they were still in businesses, were desperately trying to ride out the crash and hold on to their shirts. Companies were cutting all expenses that were not absolutely necessary to carry on business… because the revenue just wasn’t coming in. Unfortunately for IBM, purchasing a cutting edge new tabulating machine to count punch cards for its dwindling list of employees was no longer a priority. By 1930, the market for office spending was down 50%. Over the course of one of the worst recessions in economic history, Watson invested heavily in R&D and increased production. While the rest of the market ducked, Watson was preparing to strike. He wanted to be ready to satisfy the pent up demand that would be sure to explode once the economy got back on its feet. In the years that followed the crash of 1929, IBM poured millions of dollars into expanding capacity. Watson even spent $1 million (equivalent to $17 million in today’s dollars) on a brand new research facility to drive innovation. Despite all the spending, revenue remained flat and IBM’s stock price fell to record lows. In 1935, President Franklin D. Roosevelt signed The Social Security Act. The new legislation required all employees to pay into a Social Security fund they could then draw from after retirement or in the event of an illness. Companies were now required to track wages paid to employees so the government could ensure people were making their contributions to the new fund. All of a sudden, the demand for those tabulating machines sky rocketed. Not only did every major company in America need more of them, but the government needed to buy them by the boatload to do its own Social Security processing. 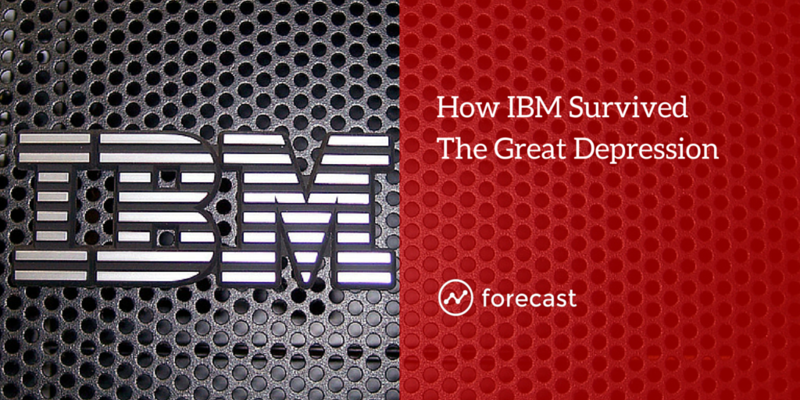 And IBM was the only company prepared to meet the demand. It’s an incredible story… because it ended well. But things could’ve just as easily gone the other way for Watson and IBM. Notwithstanding the stroke of luck in 1935, Watson made a number of intelligent, albeit gutsy, business decisions that positioned IBM for massive growth in the decades that followed. #1 – He cut his losers and ran his winners. What’s really fascinating about this story is it gives you an appreciation for how market leading firms are born. IBM didn’t start out as a giant in the business computing industry… such an industry didn’t even exist back then. But Watson saw the opportunity coming. Instead of maintaining a diverse product offering and hedging all his bets… Watson deliberately got out of certain markets (such as weighing scales) so he could invest all the company’s resources on where the industry was headed: data processing. #2 – He ignored short term market disruptions to play the long game. Calling The Great Depression a ‘short term market disruption’ is the understatement of the century. Even what we witnessed in the crash of 2008 paled in comparison to what happened in 1929… when the stock market lost 90% of its value. But even still, Watson didn’t waver. When his competitors were reacting to the market by cutting production and laying off workers, he did the opposite. He saw the long term opportunity that most of his competitors didn’t have the stomach to play… and he capitalized. #3 – He told a heckuva good story. Today, IBM may not be the first company that comes to mind when you think about brand storytelling. But in 1932, when IBM spent today’s equivalent of $17 million to open a brand new research facility in the heart of The Great Depression… Watson won the hearts of many in the business community. His message of optimism and vote of confidence in the dynamism of the American economy was incredibly well received (even though people still thought he was crazy). And when the floodgates finally opened up and companies had to start purchasing those expensive machines again… IBM was the obvious choice.